Today was Day #2 of Chocolate and Spicy Pepper Theme Week. 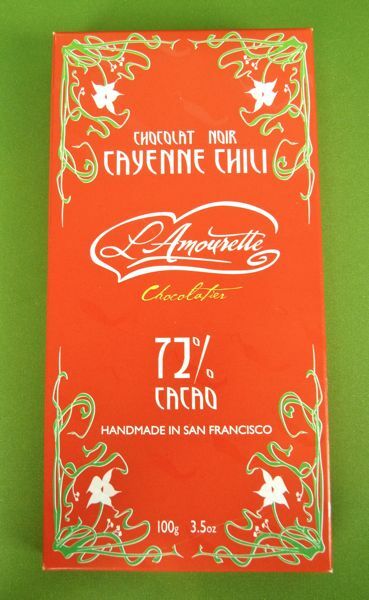 This 72% cacao Chocolat Noir (dark chocolate) Cayenne Chili bar from L'Amourette Chocolatier (San Francisco, CA) had a very hard snap, a deep, dark color, and a smooth consistency. 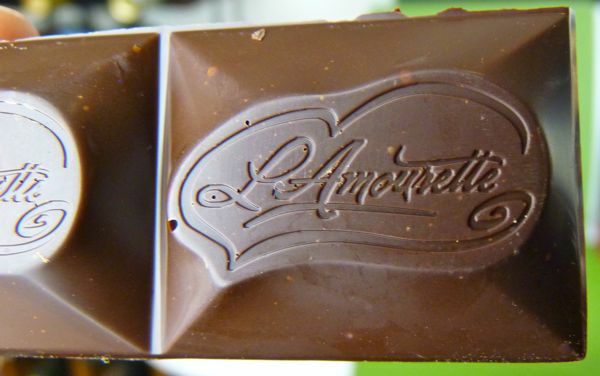 The chocolate base contained a blend of Rio Caribe and Carenero Superior beans from Venezuela. The chili flavor was present, but not overwhelming. My only quibble with this gluten-free product: the bar had a nice chocolately flavor, with a "hint of black currant," but also had a faint chemical taste.